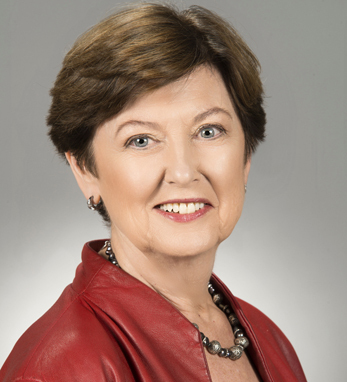 Margaret O’Kane is the founder and president of the National Committee for Quality Assurance, a company dedicated to improving healthcare quality and transforming healthcare processes through the collection of outcome data reported by patients. For her work in improving the face of patient-centered care, Margaret has been named among Modern Healthcare’s “100 Most Influential People in Healthcare” ten times, most recently in 2015. She holds a B.A. in French from Fordham University and an M.H.S. in health administration and planning from Johns Hopkins University. Margaret was introduced to the working world as clothing store assistant at the age of 16. She found it uninspiring and ultimately sought more meaning in her future career in health care. For Margaret, this determination is characteristic of her Co. Derry heritage. “The Irish are known for being resilient,” she says. “I saw that strength in the women of my family, especially my aunt who became a political activist in her Massachusetts community. It didn’t matter that she didn’t have a college degree, she was smart and confident. She became a role model and inspiration, demonstrating back then that women can make a difference.” Margaret passes the torch of O’Kane strength to her daughters, Katherine Anne and Elizabeth Claire.